You Tube is most popular video sharing website.It has a large collection of videos of every kind.You type in search box in this site and get hundreds of results.you no only watch videos bu also can upload and download videos.If you are watching a video and due to slow internet connection it has low performance or if any song you are unable to find in Mp3 then simply you can convert you tube videos into Mp3 online.There is collection of top 10 websites given below which convert videos into audios. 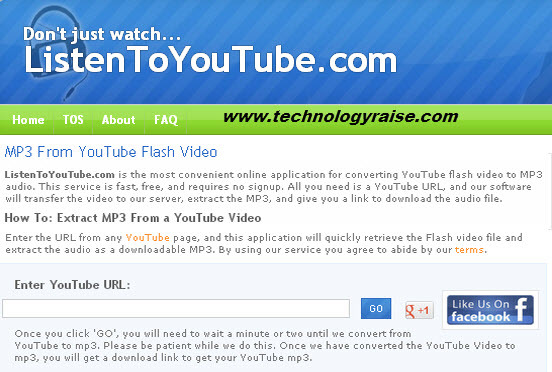 Fetchy is a modern YouTube to MP3 and MP4 converter. The first thing you notice when you arrive on the page is it's clean and simple design, but it's not just Fetchy's design which is great, as just a much thought has gone into it's intuitive layout and interactivity. To convert a video on Fetchy you can paste a YouTube link into the input field on the home page like most traditional sites, however Fetchy also allows you to search/browse YouTube videos simply by typing in the input field and clicking the search button, which really makes converting and finding videos a breeze. Unlike other conversion software Fetchy also allows you to choose your video quality option and no matter what quality you choose Fetchy will convert it into MP4 so you play your video back on all your devices! When it comes to converting YouTube to MP3's Fetchy will always grab the highest quality audio file available. Flvto.com is site with amazing features. 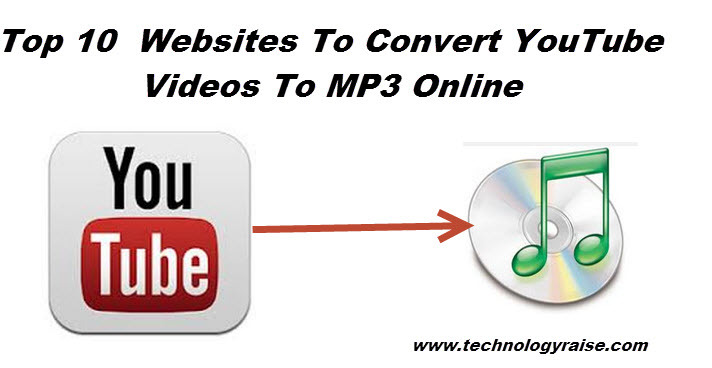 This not only converts the videos to MP3 but also convert the audio in to iPod, iPhone, and others including MP3 formats. User can convert video file having size 100 Mb to 50 Gb.This site also support adds for chrome,Firefox and others browsers. It is free of cost web service to convert the videos to mp3.You can convert video into multiple formtas like Mp3, FLV, 3GP, MP4, AVI . Its use is very simple and easy. You have to paste the URL and input the CAPTCHA and after short time you get the link of converted file for downloading. ListenToYouTube.com is quick, free, and registration free services. 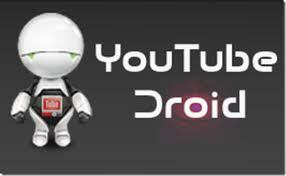 It is free of cost and show excellent performance .just paste YouTube URL of your required video , convert into the MP3, and give you a downloading link of Mp3 file. 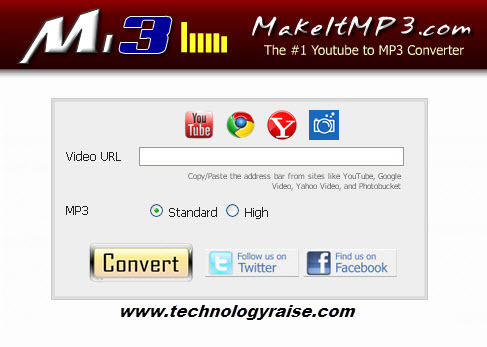 Makeitmp3.com, is most popular converter videos into audios.For this you do not require any account or registration. Its amazing feature is multi languages which is powered by google translator. Get audio from video is a site which is very simple,easy and connvinient in its use.No any software and registration is required.It support multiple formats.It allows you to convert videos from you tube as well as from vimeo. This site also allows you to convert videos into multiple formats like Mp3 ,MP4, 3GP, FLV and AVI Converter. It good feature is that it allows you to download videos into Mp3 format.So you can enjoy with music without any internet connection.It is free of cost site. This free online converter not only convert videos into audios but also can download audios from it.No sign up or any registration is required.It will show you 100% better performance. This siste has simplest way for conversion. Just paste the URL and click the “Download MP3″ button. 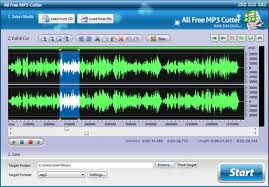 You can also cut the mp3 audio format according to your requirement.It is totally free. Finest web service is You Tube mp3. It can be used by Mac, a Linux PC or even an iPhone. It show extraordinary performance. It also support multiple languages.It is also used as app due to its add supporting features.